Yesterday evening I was down with stomach cramps when my hubby baked these perfect cinnamon rolls with teeny weeny help from me. He whipped the ingredients, kneaded the flour and then with a little bit of assistance from my end, rolled out the dough in perfect rectangles following through the remaining necessary steps achieving this wonderful outcome to his credit. I was amazed at his perfection in executing a task that he has very little knowledge of. Though I was there throughout, sitting on my desk, guiding him verbally while he carried out his first baking mission successfully, I, however, could not practically provide much assistance except some finishing touches. It is he who wearing his heart on his sleeve took the utmost effort in fulfilling the arbitrary whims of his sick wife. The below recipe is accredited to Seema Chandra whose ways to concoct any cuisine using a healthy and low calorie means always inspires in me an urge to do the same. Usually, cinnamon rolls preparation is quite time-consuming in consideration of the time allotted to the rising of yeast breads. But following the Seema Chandra way has brought about the end result barely within an hour. 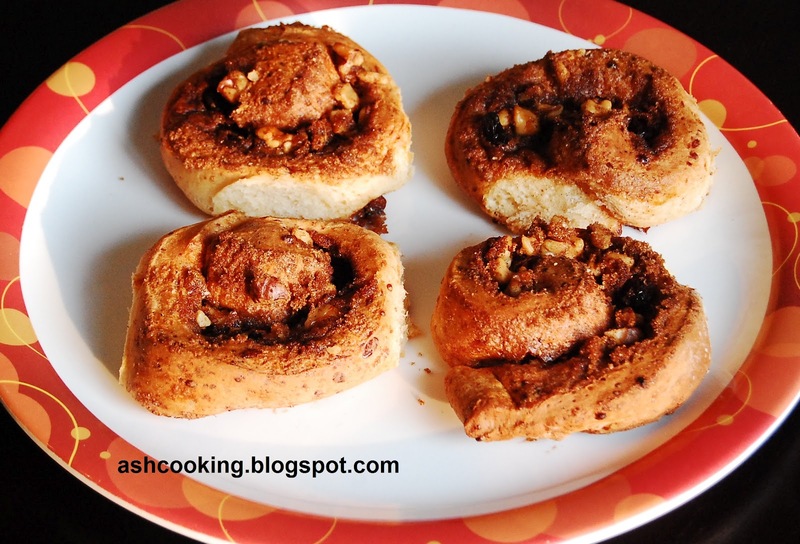 As opposed to the traditional cinnamon rolls, these homemade rolls are not only low in calorie, they are mouth-watering too. 1) Using an electric beater, whip cottage cheese, buttermilk, sugar, butter and vanilla extract together into a mixture of smooth consistency. 2) In a separate bowl, toss flour, baking soda, baking powder and salt together. Now slowly fold the cottage cheese mixture into the flour mixture and knead dough. Knead the dough atleast for 10 minutes until smooth. During the course of kneading, if the dough seems sticky to the fingers, apply a spoonful of flour to rid of the gooey texture. 3) Divide the dough into two equal portions. Sprinkle a bit of flour on the working surface before rolling each divided component into 7x7 inch rectangles. 4) Brush the rectangles with melted butter leaving an inch long strip along the long edge of the same unbuttered and completely dry. 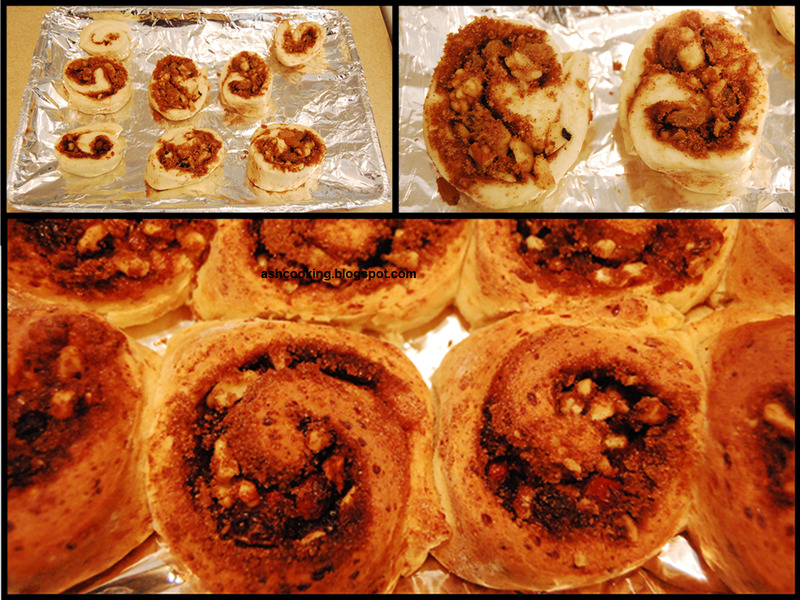 5) Meanwhile, in a bowl, mix together cinnamon sugar, brown sugar, cinnamon powder, cardamom powder, walnuts and raisins. 6) Spread this stuffing uniformly across the rectangular sheets of dough and smoothen the top gently with your fingers. 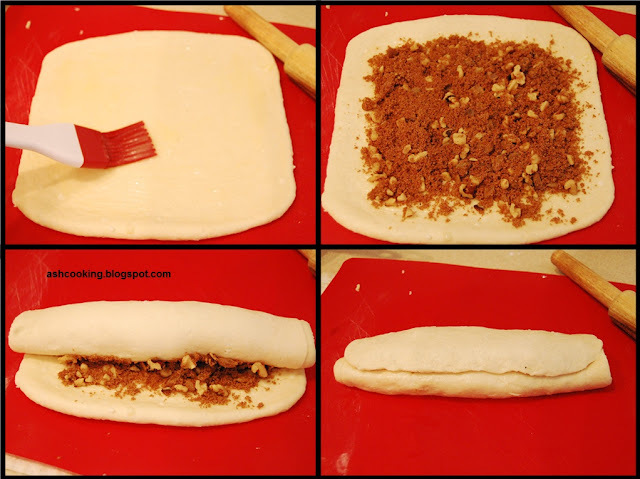 Start rolling up the dough from its long edge and when you reach the seam, moisten it with water to seal tight. 7) Using a pastry cutter or a sharp knife, cut the roll into even-sized pieces. 8) Preheat the oven to 375 F/190 C. Prepare the baking sheet by lining it with parchment paper or aluminium foil. Bake the rolls for about 40 minutes until they turn golden brown and firm to the touch. You may prick the centre most roll with a fork to test the firmness. If they appear soggy and half-cooked, return the pan to the oven and bake for few minutes more. 9) Once the rolls are ready, cool them down to room temperature. 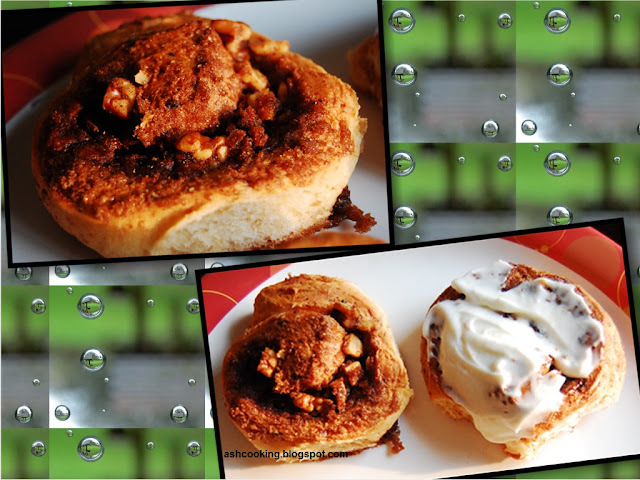 Prepare the glazing by combining the ingredients mentioned and spread it on the warm rolls.